It has been 8 years since the passion and authenticity of the Pullup Orchestra BRAP infected audiences at home and abroad. Unplugged on the streets, powerfully plugged in large festivals or in compacted Clubs: Where we play, the audience gets into a blazing fire. In the 8th year of our existence and with the new «The Brap LP» album coming out, we shift up a gear: we gave us 8 crazy challenges. Embark with us on a 45 days journey and dive into eight stages of this magical and crazy community endeavour. Again and again there will be great rewards in this campaign - it’s worth stopping by repeatedly. Eight hours live show on April 17th at Salzhaus Winterthur. Watch online or live our determination and perseverance. Come to spend the night with us on our sound! Online streaming starts at 3pm on thebrapchallenge.com and contains many surprises – it is worse watching more than one time! You want to watch the show live? 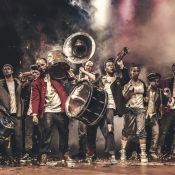 May 8th and 9th we will tour through 8 Swiss cities and play one of our energetic streetshow. In each city there will be a prominent friend joining us on stage! We will visit 8 gardens or living rooms for an intimate concert. You want to share our new BRAP album with your friends only? Then secure a private concert with your contribution to this project! What else then an adventurous documentary on the Pullup Orchestra to make the spring flowers bloom? This project takes us on the bare fields of 8 wonderful festivals in Switzerland. What comes after 8 crazy years? Eight more crazy years of course! We’ll pack our new album in eight video clips to start this next decade. We play the burning energy of «The Brap LP» unplugged at the theater Molton in Winterthur. This year, eight remixes will be created from our new album. For our final challenge our songs will be played in 8 countries on 8 different channels.